Owasco Class: USCGC Klamath, USCGC Owasco, USCGC Winnebago, USCGC Chautauqua, USCGC Sebago, USCGC Iroquois, USCGC Wachusett, USCGC Escabana, USCGC Winona, USCGC Minnetonka, USCGC Androscoggin, USCGC Mendota, USCGC Pontchartrain. 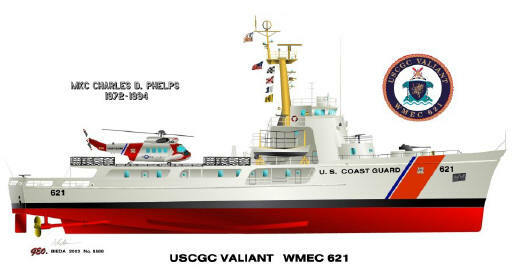 Casco Class: USCGC Casco, USCGC Mackinac, USCGC Humboldt, USCGC Matagorda, USCGC Absecon, USCGC Chincoteague, USCGC Coos Bay, USCGC Rockaway, USCGC Half Moon, USCGC Unimak, USCGC Yakutat, USCGC Barataria, USCGC Bering Strait, USCGC Castle Rock, USCGC Cook Inlet, USCGC Dexter. 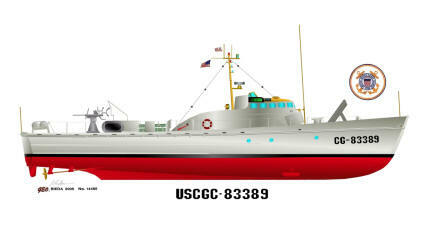 Hamilton Class (both as built and modernized): USCGC Hamilton, USCGC Dallas, USCGC Mellon, USCGC Chase, USCGC Boutwell, USCGC Sherman, USCGC Gallatin, USCGC Morgenthau, USCGC Rush, USCGC Munro, USCGC Jarvis, USCGC Midgett. Bear Class: USCGC Bear, USCGC Tampa, USCGC Harriet Lane, USCGC Northland, USCGC Spencer, USCGC Seneca, USCGC Escabana, USCGC Tahoma, USCGC Campbell, USCGC Thetis, USCGC Forward, USCGC Legare, USCGC Mohawk. 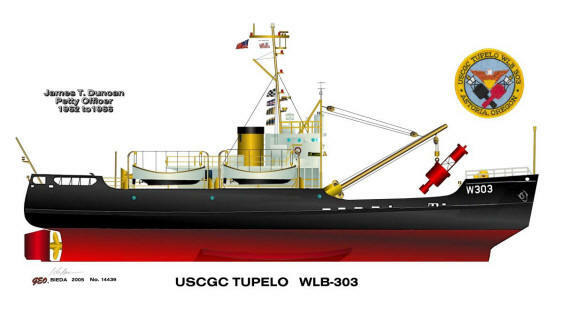 180 ft Tenders (WLB or WAGL): USCGC Spar, USCGC Acacia, USCGC Balsm, USCGC Balsam, USCGC Basswood, USCGC Bittersweet, USCGC Blackhaw, USCGC Bramble, USCGC Buttonwood, USCGC Cactus, USCGC Citrus, USCGC Clover, USCGC Conifer, USCGC Cowslip, USCGC Evergreen, USCGC Firebush, USCGC Gentian, USCGC Hornbeam, USCGC Iris, USCGC Ironwood, USCGC Laurel, USCGC Madrona, USCGC Mallow, USCGC Mariposa, USCGC Mesquite, USCGC Papaw, USCGC Planetree, USCGC Redbud, USCGC Salvia, USCGC Sagebrush, USCGC Sassafras, USCGC Sedge, USCGC Sorrel, USCGC Spar, USCGC Sundew, USCGC Sweetbriar, USCGC Sweetgum, USCGC Tupelo, USCGC Woodbine, USCGC Woodrush, USCGC Red Wood, USCGC Red Beech, USCGC Red Birch, USCGC Red Cedar, USCGC Red Oak. 165 ft Greek Class Cutters(WPC): USCGC Argo, USCGC Ariadne, USCGC Atalanta,USCGC Aurora, USCGC Calypso, USCGC Cyane, USCGC Daphne, USCGC Dione, USCGC Hermes, USCGC Nemesis, USCGC Nike, USCGC Pandora, USCGC Perseus, USCGC Triton. 125 ft Active Class Cutters(WPC): USCGC Active, USCGC Agassiz, USCGC Alert, USCGC Bonham, USCGC Boutwell, USCGC Cahoone, USCGC Cartigan, USCGC Colfax, USCGC Crawford, USCGC Diligence, USCGC Ewing, USCGC Frederick Lee, USCGC General Greene, USCGC Kimball, USCGC Legare, USCGC Marion, USCGC McLane, USCGC Travis, USCGC Vigilant, USCGC Yeaton, USCGC Cuyahoga. 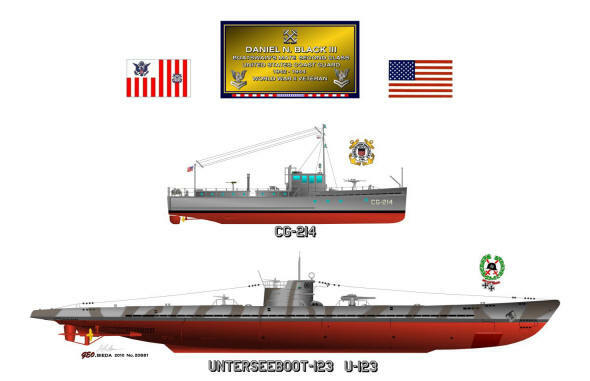 We have recently acquired plans for most CG vessels. Profile drawings of nearly every type of CG ship are possible. Please make your request. Our latest edition to our splendid collection. 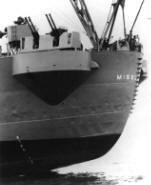 This is the same patrol boat WWII and Post WWII.